One of the biggest problems in music photography is the misunderstandings by both bands and photographers about the ecosystem we both are trying to survive in. Photographers starting off get caught up in the excitement and start giving away too much as fans and attention seekers instead of seeing themselves as fellow creatives, let alone creative business people. Bands, through innocence at best and exploitation at worst take this and run with it. The media is happy to go along as it’s getting fed free content. 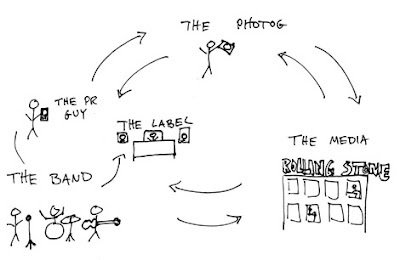 In the big picture, there's 3 parties that need to walk away happy - 1) the Band, and that includes their PR person, Label Person and/or Promotion Person, 2) the Photographer, 3) the Media. The following scenarios apply to work that was created independently by the photographer, i.e. stuff that is already ‘in the can’. (the most common) Band loves photos, wants to use them for their press shot, website, myspace; solemnly promises credit - frequently makes promises to ‘do something together’ in the future. BAND - is very happy, they have a great photo that they got for free, didn't have to set up a shoot, and have an extremely helpful visual nugget that conveys something about who they are, crucial in establishing an identity to the public. MEDIA - is very happy, they make money selling ads next to their content, and they love THIS content 'cause it’s GOOD and FREE. PHOTOGRAPHER - may be initially flattered and excited to be deemed worthy, but later starves to death when he tries to exchange a photo credit for groceries at the A&P. To add insult to injury, he finds it difficult to sell usage of his work to the MEDIA after band has already given it to them gratis. SUMMARY: Media wins, Photographer starves, and without any paperwork protecting him or the band, there is a high potential for bitter feelings and litigation. MESSY! FAIL! Band likes pictures, and negotiates a rate with the photographer to license them for promotional uses. BAND - is still happy, they had to invest a little money* in their own publicity but they have the freedom to send out good photos to all the magazines and websites that are gonna come asking for a picture. Band sees high rate of placement success in local/regional papers who don’t usually have a big budget for that stuff and frequently need images ahead of time to promote an upcoming show, release, whatever. * Somewhere in the range of $200-$1,000 depending several factors: indie label/major label size, duration and scope of agreement, etc. MEDIA - is still happy as a pig in filth, they love good content that is free to use, and guess which photos they like to run…. FREE ONES! PHOTOGRAPHER is happy after putting some money back towards his credit bills** and can sleep at night knowing at the end of the license term (a year, two years, etc) he controls his creative work exclusively. He also enjoys seeing his work published with credits. Photographers need to make $15k a year, JUST TO BREAK EVEN, and that's not counting rent, groceries and all the other essentials. SUMMARY: Everyone acts like a grown up, fills out a little paperwork, throws around a little bread and the machine grinds on. Win win win! Freelance Photog shoots, deals with media directly, retains all control over his images and hopefully nobody shoots themselves in the foot. BAND - Optimistic, but has lost a bit of control over their own publicity, more at the mercy of the photog and media not screwing things up. Still getting coverage if they are legit/worthwhile. MEDIA - A little bit hassled by having to chase things down, but they have someone called a ‘photo editor’ whose job it is to find and license images depending on 2 opposing factors: price and quality. Will huff and puff about having to pay for something, but ultimately will do the right thing, but if they don’t and the photog walks, then the band is kinda screwed. PHOTOGRAPHER - is navigating things on his own, selling a license for use of photo is in the range of $50 (indie weekly) to $200 and up (national magazine) per image depending on size of reproduction and readership of the magazine. Upside too is that he is building his contacts and relationships with editors directly. SUMMARY: Band has more beer money but might lose out on some opportunities, photog is T.C.B. and Media is reminded that once upon a time, they paid for content. A little complicated but that’s life.